Our community has much to be thankful for this holiday season. The good news is our community’s beautiful new Roosevelt Branch of the Chicago Public Library is being constructed at a record pace, and will be open within weeks with the apartments above it to soon follow. Related Midwest not only took some substantial contractual risk to make the project happen in record time, but it also engaged in unprecedented efforts to exceed MBEW, and local hiring objectives, and did so with great skill. The bad news, for now, is that Related Midwest cannot make the numbers work for the 25 or so market-rate townhomes it was to break ground on this year on Grenshaw St. A combination of rising construction costs, rising mortgage rates, the complex financing scheme, and other requirements for redeveloping federal public housing, the much longer lead time required to build anything on CHA land, and likely overly ambitious initial price points during the design phase, given what has now become a cooling for-sale housing market, are all responsible for the delay. It’s not all bad news, however, because Ald. 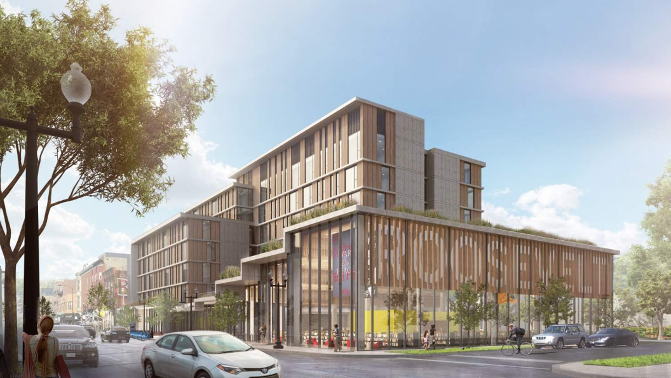 Ervin has made it clear to Related Midwest, and the CHA that nothing more will be built at Roosevelt Square until Related Midwest builds its promised market-rate housing. Related Midwest is a very large, very savvy development company, and their property management arm responsible for its very large portfolio of subsidized housing is perhaps one of the best in the nation in that arena. C4C also helped spearheaded the formation of a public safety committee comprised of the UIC Police, 012th District Police, CHA safety, and security personnel, private security contractors, and large community property owners that is having success. Effectively addressing crime is far more complex than many people realize, and requires systemic, comprehensive approaches. Focus has completed its substantial upgrade of the old Medical District Apartments, now rebranded as SCIO, on the northeast corner of Ashland Ave., and Taylor St., and as soon as it fully secures its financing should break ground in Q1 of 2019 on its new rental building on that corner, which is a bit slower than it wished, but real estate financing is becoming increasingly tricky with rising interest rates. Regarding C4C’s high school initiative in partnership with the West Central Association, WCA, while we have a $70 million line item in the CPS Capital Budget, we do not yet have a location or complete assurance that our new high school line item could survive a new mayoral administration. Getting a line item does, however, mean that the CPS executive leadership, and the Chicago Board of Education supports the initiative, as it does not add capital line items unless projects are vetted internally at CPS. C4C also has assurances from top executive CPS leadership in important positions, that will survive a new mayoral administration, that they will do everything they can to help us make our compelling case of need for our innovative model to a new administration at City Hall, and they have provided some strategies for so doing that heretofore have not been presented to us. We are very encouraged by their insights, and offers of help, and we also recently began discussions with Chicago Teachers Union executive leadership about the benefits, both to CPS, and to City of Chicago’s property tax base, of our innovative model. It is our belief that we will see an innovative, exceptional new high school open in the new year, and our C4C, and WCA team continues to do substantial community engagement, and outreach on the new high school. ← A community amenity happened quickly!